Uncover the treasures of Greater Poland, Masuria and Pomerania. Update from March 22, 2019: there still a few vacancies left. Based on our many years of experience in providing Genealogy Tours and other historical and cultural tours in Poland, as a complement to our tours to the former Austrian and Russian partitions of Poland, we present you the Prussian Poland Tour. Your arrival. Airport pickup and transfer to the hotel. Some time to rest after the journey. Read more about how to arrive in Poznań by plane. In the evening: Welcome dinner in one of the restaurants in Poznań. Accommodation: Comfort class hotel in the center of Poznań. Where else could we begin this journey through the history if not here, in Poznań. Poznań is among the oldest cities of Poland and was one of the most important centers in the early Polish state in the tenth and eleventh centuries. After the partitions the city of Poznan was officially named an imperial residence city, leading to the construction of the Imperial Castle, the Imperial District, the Opera House, new city walls, railway station and many other sites which make a big part of its landmarks to this day. It is best known for its renaissance old town, destroyed during World War II and then rebuilt, and Ostrów Tumski cathedral. Today, Poznań is an important cultural and business centre and one of Poland’s most populous regions with many regional customs such as Jarmark Świętojański, traditional Saint Martin’s croissants and a local dialect. We will begin guided tour with Poznan cathedral, you will also see the archaeological reserve Genius Loci. Among other attractions we will show you the Old Town with market square, Baroque collegiate and town hall, where you will see the famous mechanical goats’ butting display. In the afternoon for volunteers exploring Wilson’s Park and Palm House, Citadel Park and Shopping, Arts and Business Center “Stary Browar” with preserved 19th century beer factory. After breakfast check-out from your hotel, leaving Poznań. First stop in Gród Pobiedziska: a reconstruction of the wooden fortress from the beginning of the Polish State. Located in the heart of the Piast Route, halfway between Poznań and Gniezno, you will learn here about architecture, the art of war and aspects of everyday life during the reign of Mieszko I and Boleslaw Chrobry (the Brave). We will explore the exhibition on medieval siege engines in the natural scale, armory, and working catapult. About noon we will arrive in Gniezno. After short break for coffee or lunch, we will visit the cathedral where the coronation of the first Polish kings took place with famous gate and confession of St. Adalbert. After Gniezno stop in Biskupin: Slavonic settlement from the Bronze Age, that survived through the ages, flooded by the waters of the lake. In the late evening arrive in Toruń, picturesque medieval city, the hometown of Copernicus. Accommodation: Hotel in the center of Toruń. One of the medieval tenement houses on the market square in Torun. Today we will tell you the stories about Polish Teutonic wars. Who were the Knights of the Cross described by Henryk Sienkiewicz? Why they were residing in Poland and what impact did they have on the history of this part of Europe. We will visit the battle of Grunwald museum. Fought on 15 July 1410, was one of the largest battles of Medieval Europe and is regarded as the most important victory in Polish history. 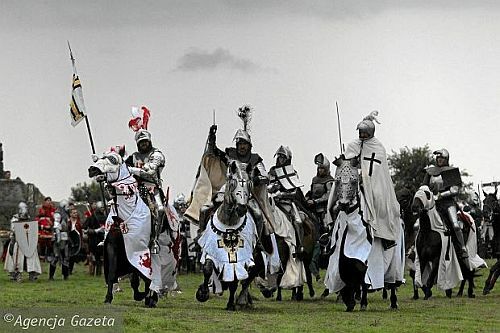 Historical reconstruction of the battle of Grunwald. Picture credit: Agencja Gazeta. 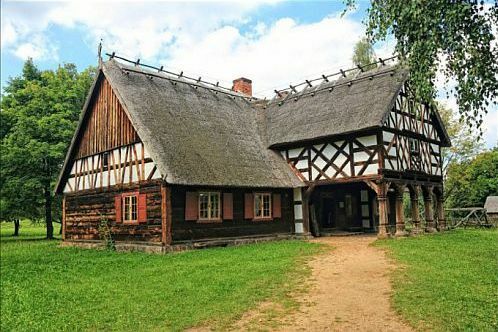 In the afternoon we leave the medieval times and move to 18th and 19th century life in the villages of the Eastern Prussia. 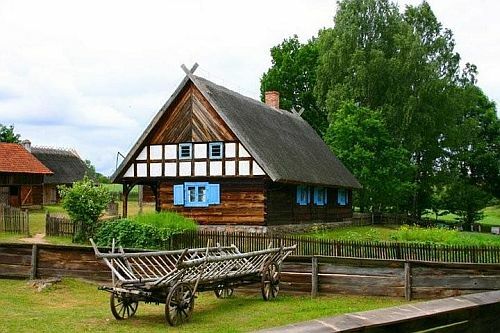 In the Ethnographic Park in Olsztynek, we will introduce you to the everyday life of your ancestors. Accommodation: Hotel in the lakes district. Day 5 Masurian Lakes District. Nature and Wildlife. Morning travel to the heart of the Masurian Lakes District. Optional: visit in the Wild Animals Park in Kadzidłowo. The aim of the park is to protect and research the primarily native species (such as the lynx, wolf, eagle owl, black grouse, capercaillie, hazel grouse, elk, deer). Location on forest meadows allows the existence of animals in conditions close to natural. It is possible to access certain species on their extensive paddocks and even feeding, stroking and admiring up close. The walking paths in the park require some moderate physical fitness and good weather so in case this will not be appropriate for the group, we will offer you some alternative attraction in the area. Visit in Mikołajki. Cruise on the Śniardwy lake (the larges in Poland). 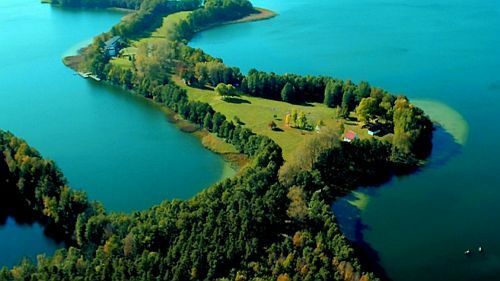 Mazury Lakes. Picture credit: nature.desktopnexus.com. Day 6 The Wolf’s Lair, Reszel and Święta Lipka sanctuary. Visit in Gierłoż – Adolf Hitler‘s first Eastern Front military headquarters in World War II. The top secret, high security site was in the Masurian woods about 8 km (5.0 mi) east of the small East Prussian town of Rastenburg (now Kętrzyn, Poland). In the afternoon stops in Reszel, a small town in Warmia region, with the Gothic Castle and the medieval city center surrounded by brick defense walls. We will show you also Święta Lipka (“holy tile”) sanctuary, a masterpiece of baroque architecture. 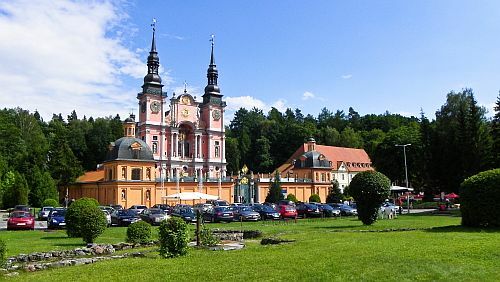 The basilica in Święta Lipka. Picture credit: wikipedia.org, Alfista33. Day 7 From East Prussia to Pomerania. In the morning we will leave the hotel in Masuria and we will drive to Pomerania. Dependent on the weather conditions this Autumn and the permission of the waterway office, we will have the cruise. The Elbląg canal is considered one of the most significant monuments related to the history of technology and was listed by Unesco. 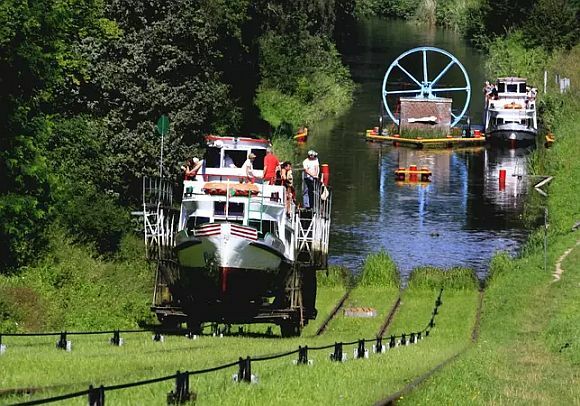 In Buczyniec there is one of inclined planes and the exhibition about the canal and cruise one of the tourist routes. If the cruise will not take place, we will provide alternative attractions along the way. In the afternoon arrival in Gdańsk. 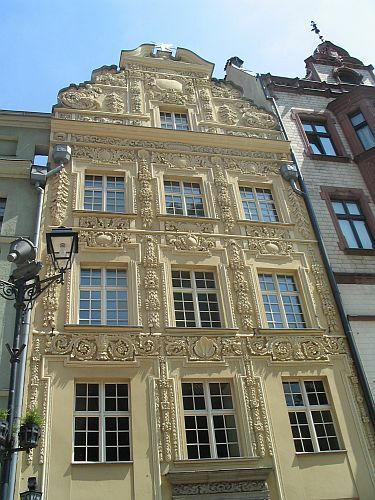 Accommodation: Hotel in the center of Gdańsk. Morning drive to Malbork Castle – the largest teutonic castle in Poland and one of the largest castles in the world. In the afternoon you will have the free time in Gdańsk. 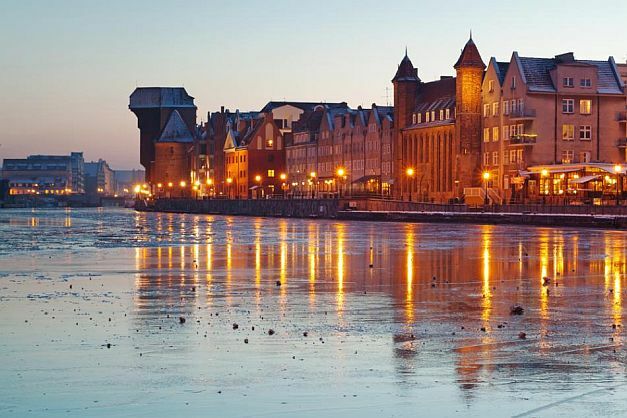 Today you will have the guided tour with local guide from Gdańsk who will tell you about the oldest history of the city which was the member of the Hanseatic League. The culmination of our itinerary will be the afternoon visit in the port of Gdynia an Emigration museum. 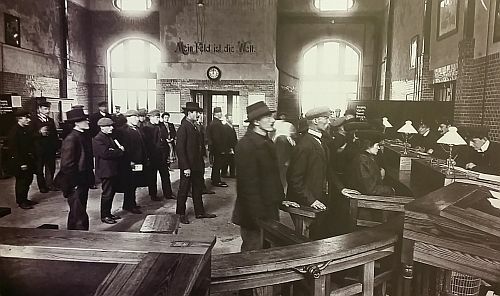 The exhibition presents the history of departures from Polish lands over the centuries. Today, there are more than 20 million people of Polish descent in the outside world! Can we feel what other Poles felt, as they were leaving their homes at the end of 18th and 19th century? who can understand this better than the descendants of the Polish emigrants! 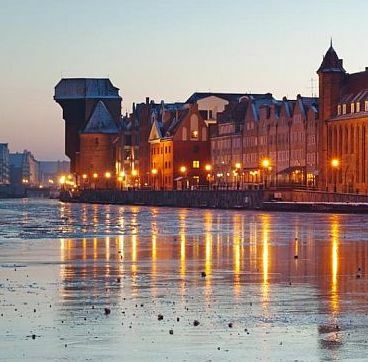 Because of its location Gdańsk was always the tension point between Poland and Germany. Today we will show you the Westerplatte monument, place where took place the first battle of the European theater of World War II. We will also have a tour in Stutthof concentration camp, which after the invasion of Poland in World War II, used for the imprisonment of Polish intelligentsia. We will also focus on modern times as Gdańsk was the scene of anti-regime demonstrations, which had the impact on the downfall of the communism in Poland. There is the fabulous exhibition about the Solidarity movement in European Solidarity Centre in Gdańsk shipyard. In the evening we will try to summarize and discuss the best moments of the tour during the farewell dinner in Gdańsk. From Gdańsk to Warsaw (travel by train, we can help you to arrange the train tickets and airport transfer in Warsaw. There would be a supplement for such an additional service). The total cost of Prussian Poland Tour is 10 900 Polish zlotys (SGL room supplement: 2250 PLN) (Around US$2880, (SGL room supplement: US$595) according to currency exchange rate from November 2019). First Minute price till 31 December 2018: 10 400 Polish zlotys (in DBL or TWN room occupancy). If you are returning PolishOrigins Tours client or want to combine Prussian Poland Tour with tailor-made Genealogy Tour or Family & Friends Tour then you are entitled to a 500 PLN discount. Discounts do not combine. Tour cost includes: accommodations in comfort class hotels in TWN/DBL rooms with private bath or shower, two meals daily: breakfast, lunch or dinner, transportation between cities by air-conditioned, comfortable mini bus, sightseeing tours as specified in the tour itinerary, baggage allowance of one suitcase per person, services of an English-speaking guide throughout the whole Tour, hotel taxes, transfers on arrival and departure from and to the airports or hotels. Not included in the tour cost are items of personal nature such as laundry, telephone calls, mini-bar, gratuity to guides and drivers, air transportation to and from Poland. Important: The deposit is refundable until the 90-day before the date of starting your Tour. If a tour has less than 5 persons who have made reservations 2 months before planned date of starting the Tour, we reserve the right to cancel the whole Tour. In that case, all deposits for that Tour date will be refunded. The Prussian Poland Tour is carefully designed and prepared, with attention to all the details, from the leaders of the tour, the transportation, accommodations and the attractions chosen in our itinerary. To keep a private character and atmosphere, our group size will not exceed 15 participants.